After the Christmas glory, I came home to the daunting task of adding our 1 year old’s new toys to the mass that was already overwhelming our living room. 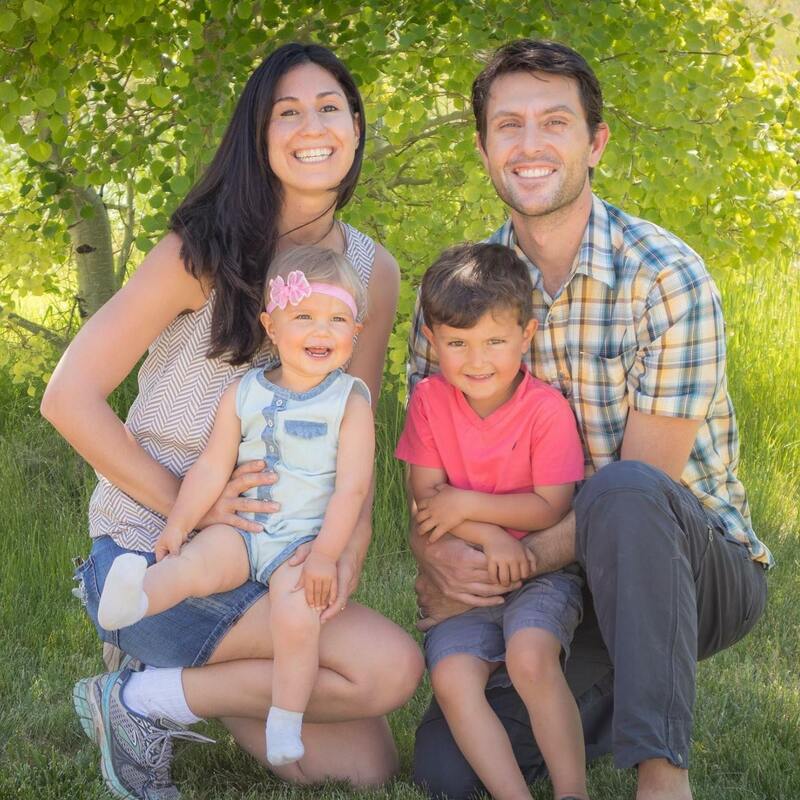 I had started out with a Montessori-inspired philosophy of minimalism with toys. 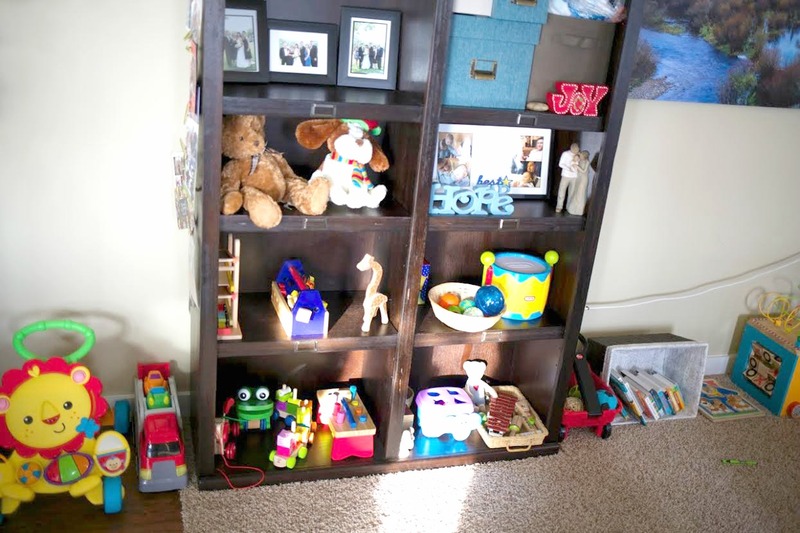 I wanted to have just 2 shelves with limited items that encouraged development and learning. After just 1 year, What I ended up with was 6 cubbies, a large 3-tiered shelving unit of tubs, and 10 feet of floor space taken overflowing with stuffed animals, cars, books, walkers, a learning cube, and more! 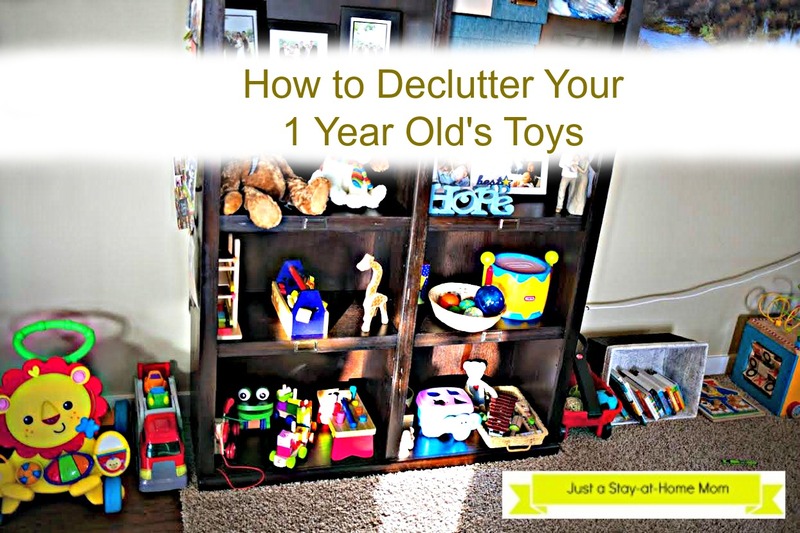 So, how do you declutter a 1 year old’s toys? 1. I decided to sort the items into just 6 cubbies and 6 feet of floor space. This felt almost impossible, but I knew I had to cut the clutter by about 60%. 2. I limited the book area to 15 books: new ones and some of his current favorites. 3. I grouped like items into baskets (ie. the music instruments all went together in a basket). If there were items that didn’t group well with others, they had to either be big enough to be stand-alone items on the shelf (like the pull-along dog and frog), or they went into a sorting pile. Some items I realized he has outgrown (like several shakers and infant rattles). These got placed into a box with outgrown clothes, so hopefully child #2 can enjoy them. Items I know he still enjoys were put in a bin to be rotated in at a later date. 3. I put the shelves of tubs into our entry hallway (leaving plenty of room for coats), and decided that would be the place to use for trading out toys every 1-3 weeks. 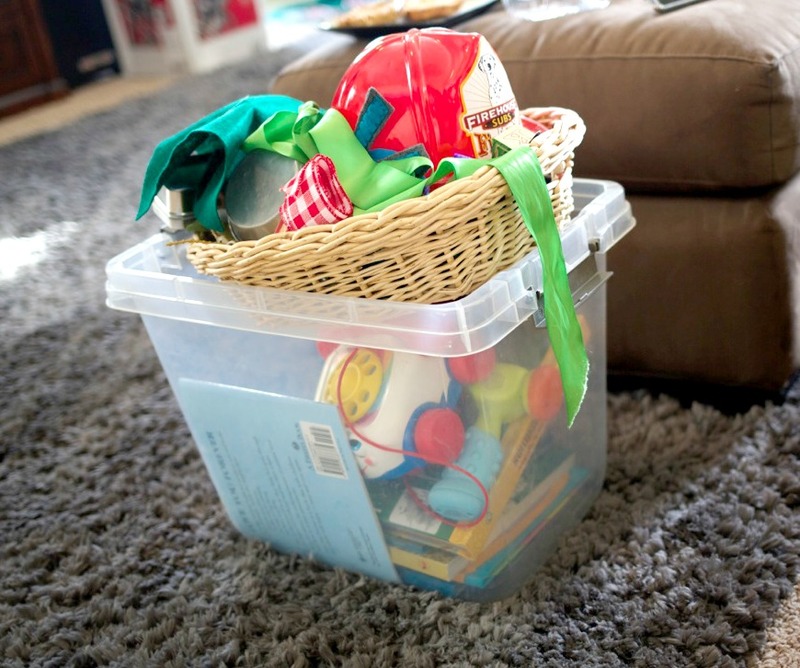 This way, our little man will be less overwhelmed by the toys to choose from and more likely to stay focused on playing longer with the toy he chooses. 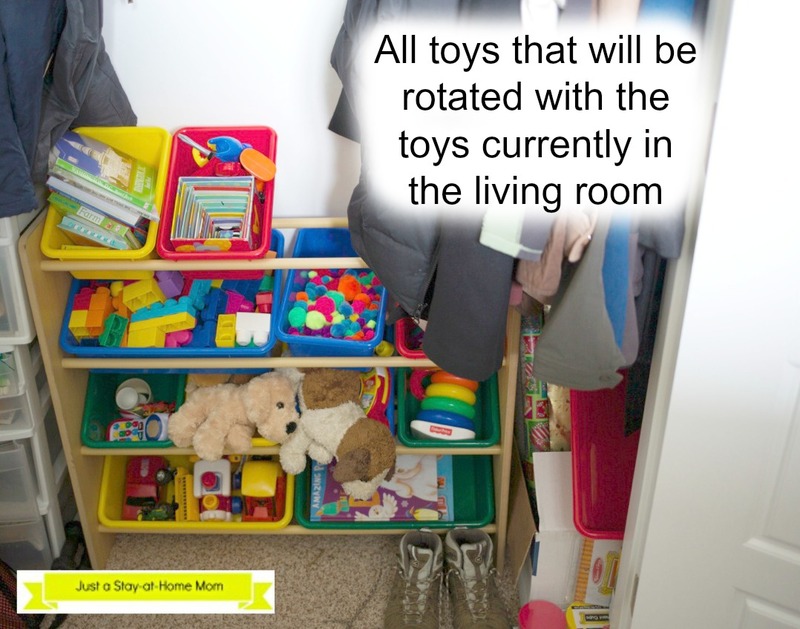 Also, it keeps toys exciting and stimulating by being able to cycle toys in and out every few weeks. *That’s what I’m hoping for at least (after researching several other blogs on minimizing toys). And voila! I promise to update you in a few weeks as to how it is going. If you minimize your toy space, I’d love to hear how it goes too! For now, I’m very happy with the decrease in clutter. Feels like my living room just lost 25 lbs! Want to declutter your kitchen? Here’s a great post from Hammersparklechalk to get you organized!